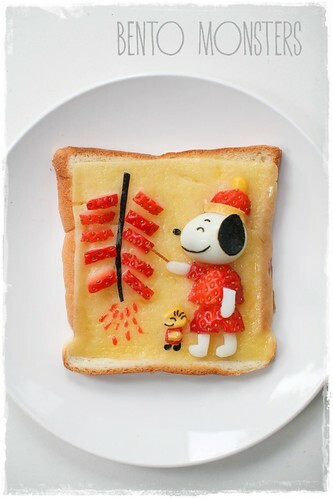 I'm not sure if this is going to be my last Chinese New Year foodart. I do have some ideas but somehow, I just do not feel like making them, ended up making some other stuff instead. 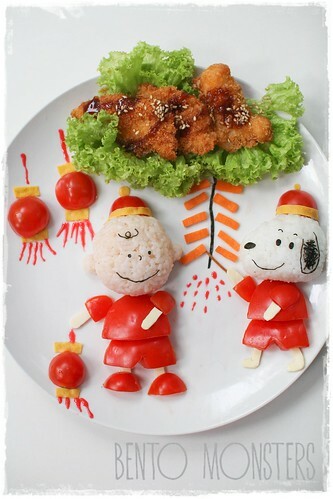 Happy New Year greetings from the Peanuts gang. :) It is auspicious to wear red and bright colours during Chinese New Year. Chinese also set off firecrackers on New Year's Eve. Firecrackers are actually banned in Singapore for security reasons. 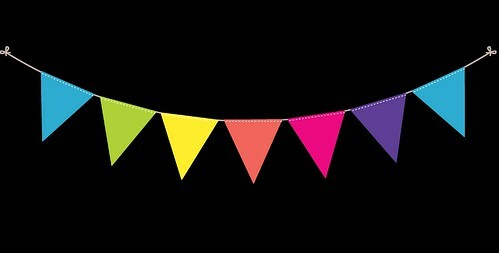 However, we are always in Malaysia on New Year's Eve, so my boys get to see firecrackers and play with fireworks there. 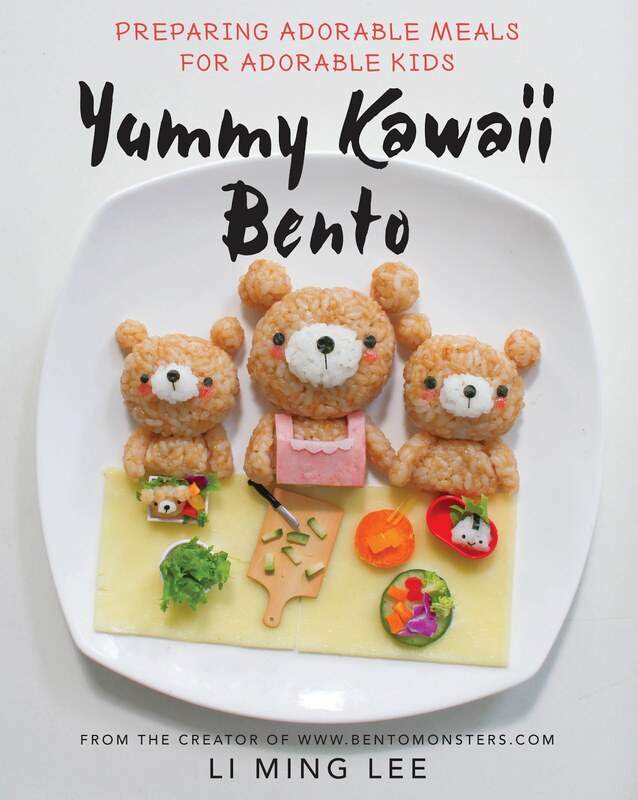 Ingredients used to create this foodart were rice, tomatoes, nori and egg sheet. 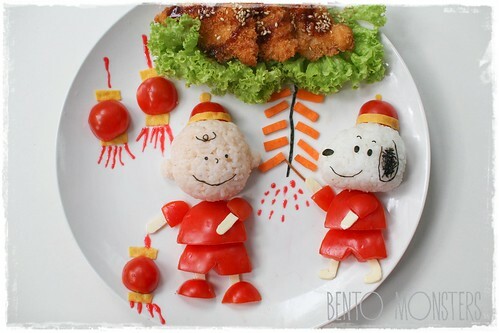 A toastart version with Snoopy and Woodstock decked in their Chinese New Year costumes. Ingredients used for this were quail egg, strawberry, corn and nori. Gorgeous! 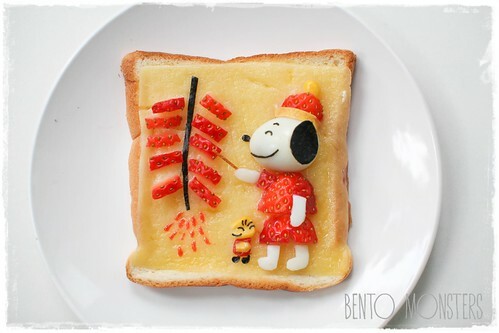 I always love your toast art! love the use of tomatoes! This is super cute, I love everything from the fire crackers to the costumes!